Consumers’ expectations of brand’s FMCG packaging are changing for the better. Where convenience was once the main desire of consumers, the past year has seen hugely increased customer pressure on brands to reduce their use of plastic packaging due to its damaging environmental impact. This trend, coupled with the increased demand for responsible corporate behaviour is re-shaping the packaging industry more than ever before. As a environmentally-conscious packaging design agency, CuCo take the sustainability of the packaging we design very seriously and are constantly searching for ways to improve our client’s packaging through environmentally-friendly innovations. We’ve all been there: you turn down the supermarket fruit aisle only to find that the majority of fruit is – despite fruit’s natural ‘packaging’ – wrapped in plastic. To overcome this problem, the Hungarian Designer Agnes Gyomrei developed the concept of VitaPack. Made from 100% recyclable cardboard, this orange packaging concept is designed with both convenience and sustainability in mind. VitaPack can hold 0.5 kilo of fruit per pack and can even be transformed from a square to rectangular shape by tearing along the perforation. A clever and great example of how fruit packaging can be made more environmentally friendly through cardboard engineering! You may well be surprised to find KFC on a ‘sustainable packaging’ list. However, last year the fast-food chain made headlines as it announced that it plans to roll out a range of edible rice bowls in stores in Bangalore, India to help the increasing waste problem in the Southern part of the country. A great idea that could revolutionise fast-food packaging and will hopefully become reality in KFC stores all over the world! Would you eat a KFC bucket? Over 80 Billion Plastic Bottles are produced every single day, of which 80% end up on landfills, where they then take 800+ years to biodegrade. The solution? A water bottle made from paper. 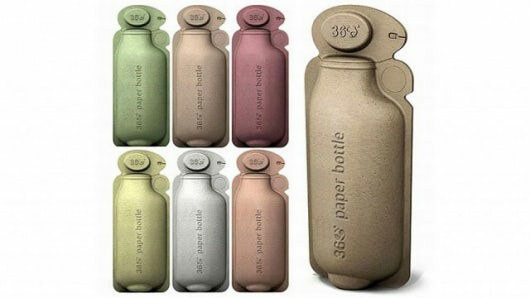 Paper Water Bottle is the first of its kind representing a new, innovative and eco-friendly way of consuming water. Their ECO 100 bottle is made from 98% compostable materials, which will biodegrade within a much shorter 80 days – that’s nearly 4000 times faster than plastic bottles! The remaining 2% are recycled materials, meaning this bottle creates absolutely no waste. The bottle is still in development and will be available in 2020. We can’t wait to see this 100% sustainable bottle on the supermarket shelves! Coconut water has become extremely popular all over the world in recent years. However, rather than selling the delicious healthy coconut drink in a tetra pack like most other brands , ‘Genuine Coconut’ sells its coconut water in its natural container – the coconut itself! On top of this, all the coconuts are 100% organically grown – a great and extremely environmentally friendly packaging solution. Are you a food brand looking for a sustainable new packaging design? Contact CuCo today on 01202 911959 or email hello@cucocreative.co.uk – we’d love to help!